Building an air-lift with the height larger than depth? In depth subjects relating to Airlift. I would like to build an air-lift pump to circulate the watering system. The system may look as followed. The water from T1 will be pumped (via the orange pipe) to T2. 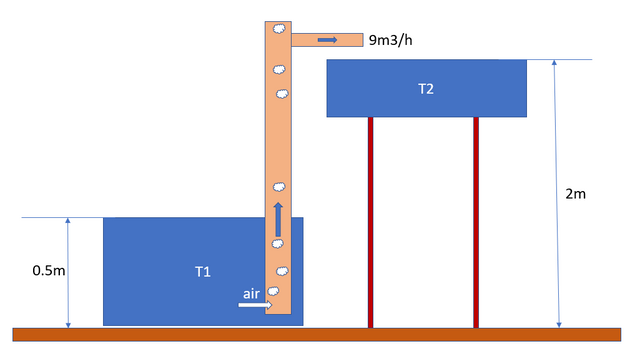 Flow rate about 9m3/h. Re: Building an air-lift with the height larger than depth? I hate to say it but it's not possible the way you designed this system. We are talking about a discharge head of over 1,5 meters. If you want a yield of 9000 liters the maximum discharge head would probably be around 10 centimeters if you are lucky. The system has to be level, even at 5cm of discharge head you're wasting a lot of potential. This system is just not designed for it. If you have any further ideas or questions, feel free to share them. In a level system, a flowrate of 9000 liters per hour is easily achieved. There are other air lift methods that will achieve higher lifts, from 0.5 to 2.0 feet (15 cm to 65 cm) with flow rates up to 300 gph (1200 lph) using 40lph at 3psi pumps (I know cause I've done it...) but I haven't attempted to lift water that high. I would assume you'd need a very robust air source and use of a very deep sump to allow that sort of lift.